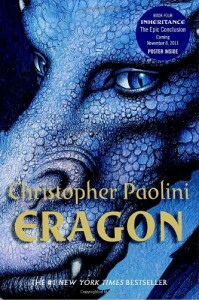 Eragon is about a boy that finds an Egg and a whole lot more! Considering Eragon is written by a teenager the story isn't too bad; a bit simplistic but overall a fun read that flys right past you almost as quickly as the Dragon, Eragon, grows. I borrowed the book from a friend and never got around to reading the others in the series. I am glad I didn't buy it as I don't think it was worth the price of a used paperback let alone a hardback.